The Flower Fairies descended on the Flint Barn on Wednesday evening to spread their floral fairy dust over the barns! 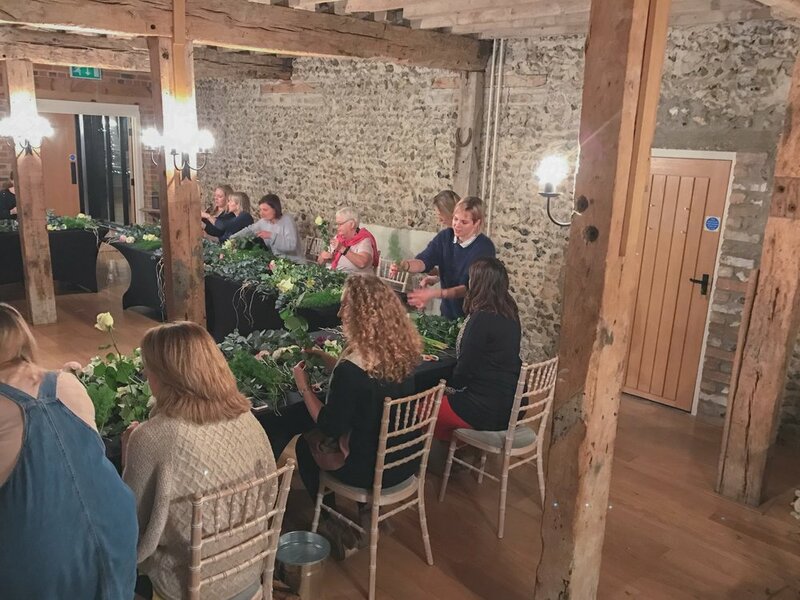 With endless amounts of eucalyptus, beautiful blooms of ranunculus and elegant stems of calla lilies, Clare and Julie transformed the barn in to a flower heaven for our thirteen wannabe florists. The girls kicked off proceedings by introducing their new students to the array of flowers they were going to be working with and explaining how to prepare and condition the different types of flowers ready for assembly. 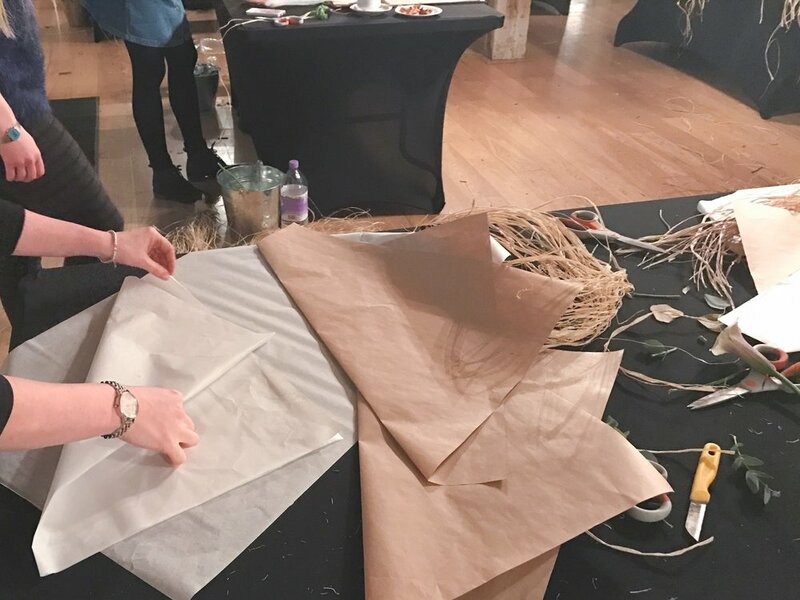 It was a great insight in to the time and knowledge that florists use and need everyday to create the specific arrangements their customers require - a real art form! After preparing and conditioning then came composition. As full-time florists, the two Flower Fairies made gathering the stems together look effortless and in a matter of minutes, Julie had produced a stunning bouquet of seasonal blooms and foliage. 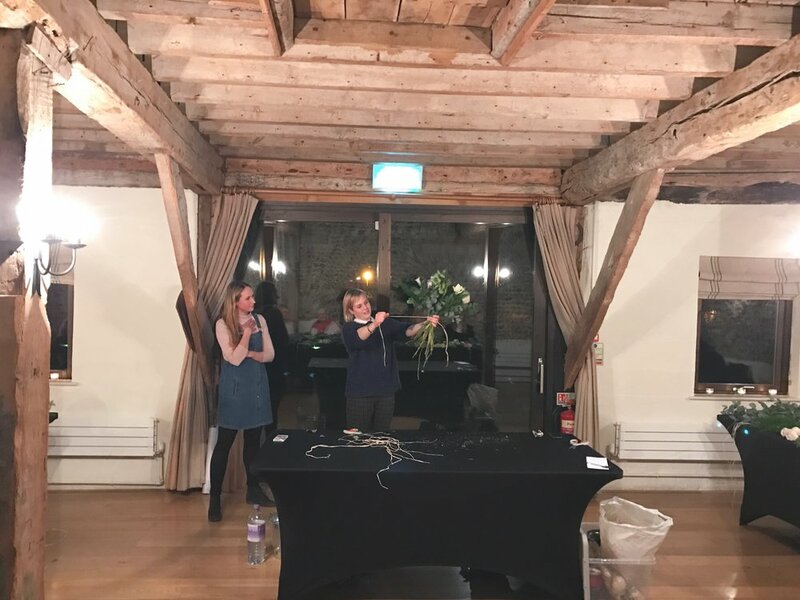 With their flowers tied and trimmed, Clare and Julie then walked the ladies through wrapping and finishing their bouquets, adding that final professional touch. The Flower Fairies were excellent teachers, always on hand to guide their students and lend a (strong) hand if the ladies needed it! 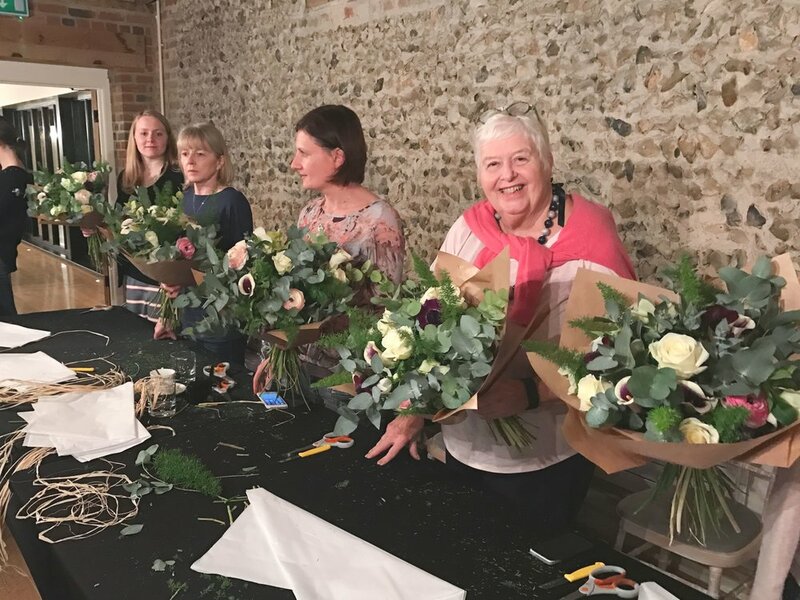 A fantastic evening was had by all :) We hope that these talented ladies will continue to use all of the new skills they learnt from the evening in their future floral endeavours and visit us at the barns again soon for the next workshop on Wednesday 3rd May! Why did you form ‘Flower Fairies’? J: Me and Clare first met working in a flower shop together (The Flower House, Cambridge) and our friendship blossomed from there. We have worked together many times over the years but have always wanted a project to work on and build together. We came up with Flower Fairies as we loved the idea of sharing our passion for flowers with others through teaching. It means we can both carry on our floristry careers and have Flower Fairies as a fun and enjoyable side project. Being best friends it doesn’t even feel like work. What ‘floral trends’ are you loving at the moment? C & J: More weird and wonderful ways of displaying flowers at venues and for table decorations are becoming a trend we love. We particularly like the use of copper piping framework for ceremony backdrops teamed with geometric terrarium table centres, a way to bring some quirkiness to the floral décor. Combining this with wild, natural and overflowing bouquets incorporating lots of greenery and interesting textures is a gorgeous combination, softening the harsh angles with romantic blooms. As full-time Florists, you both have a fantastic knowledge of flowers, an understanding of composition and an all-important creative eye! What flowers are in season at the moment and what would be your favourite way to use/display these? C & J: In early spring the flower markets are full of beautiful bright colours and gorgeous blooms such as tulips, anemones, ranunculus, daffodils, mimosa, hyacinths, muscari, hellebores and narcissi. We especially love the striking giant-headed ranunuclus called Cloony ranunculus, so pretty! Spring flowers are great for adding splashes of colour to any room and look lovely displayed in fun, mismatched containers such as jugs, teapots, tin cans, colourful bottles and mason jars. Clare, we loved having yourself and your now hubby Rich (aka Biscuit!) tie the knot here at the barns last October. As your best friend and fellow FF, Julie worked alongside you to create your stunning floral arrangements (including bouquets, button holes and garlands to drape along the beams), totally transforming the venue and putting your talents on display throughout, simply stunning! Where did the inspiration for your wedding flowers come from and how did you both find the whole experience? C: There is so much beautiful floral inspiration in autumn and I have always loved the gorgeous flower varieties, colours and textures that are available. We let what was in season guide our flower choices and we choose designs that we felt complimented the time of year. 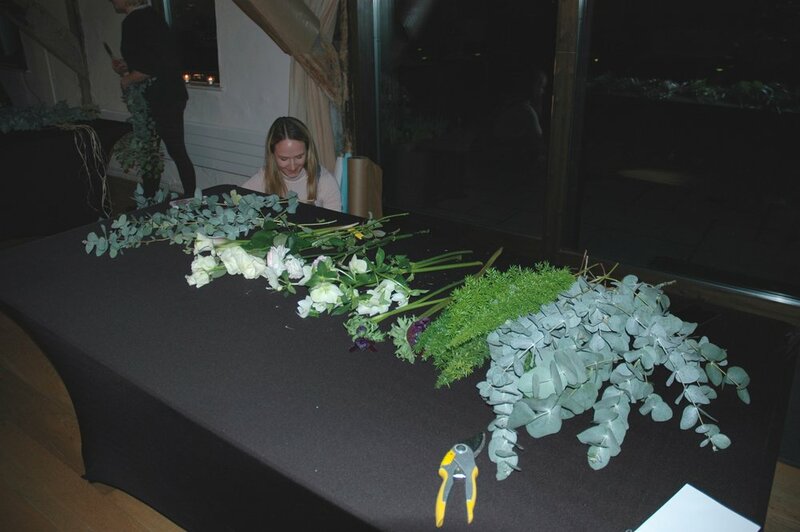 Flowers were the main and most important décor for our wedding and we had a lot of fun working out ways to have flowers dress the barns from the floor to the beams. C & J: We always really enjoy working together but on this occasion it meant so much to us both. From the planning stages months before, right down until the final finishing touches on the morning. We love bouncing ideas off each other and sharing our creativity, and to see it all come together on the day was incredibly special. Walking down the aisle together as bridesmaid and bride and seeing all our creations adorning the barns, it really was magical. Julie what was your favourite part to work on? J: For me, it had to be Clare’s bridal bouquet! To create the bouquet that Clare would carry down the aisle to marry the man of her dreams was a huge honour and meant so much to me. Being best friends and fellow florists, there’s a great passion for flowers that we share and have a unique bond over. I made the bouquet with such thought and love, I even put a crab apple from her garden in there for a little piece of her home with Rich. I kept Clare’s bouquet hidden from her until she was in her dress on the morning, the moment I handed it over to her was probably my most treasured memory of our friendship to date, it was such an emotional exchange for us and I will never forget it. Also, the giant flower balls deserve a mention, they looked stunning! 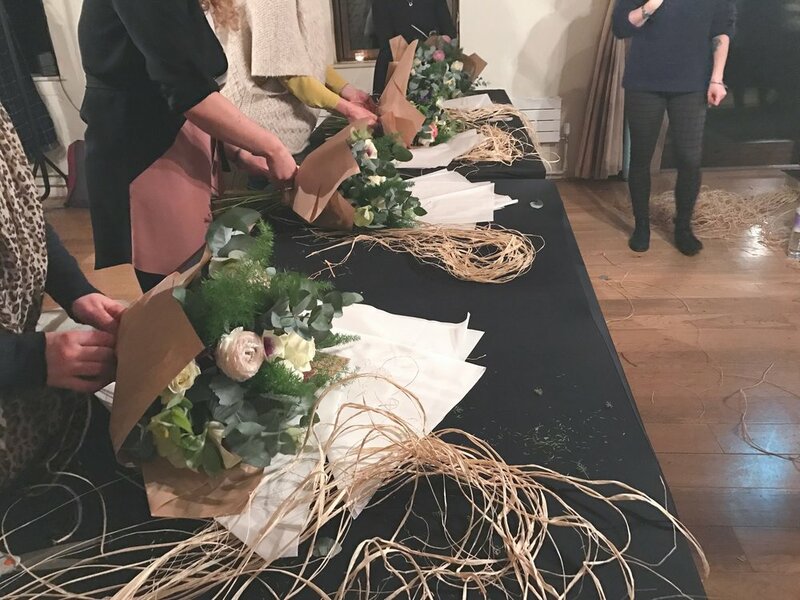 From wreath making to flower crowns to bouquets, you have covered many aspects of floristry in your previous workshops. What’s next on the agenda for the Flower Fairies and how can people sign up?! C & J: We are currently in the process of putting together bespoke packages for special occasions such as hen dos and birthdays. We love the idea of making flower crowns with hens as their afternoon entertainment before their big night out, providing not only the fun activity itself but a floral accessory to wear out too! We also run regular workshops at The Little Acre Kitchen in St Ives. Our next one is a floral foam arrangement workshop and will take place on Wednesday 22nd March. We are also delighted to announce another Flower Crown Workshop at The Granary Barns on Wednesday 17th May. For details or to book onto these classes, or for more information about private classes, email us on flowerfairiesworkshops@outlook.com.